Beijing's population in 2017 was 21.7 million, 22,000 fewer than in 2016, according to a study released on Dec. 9, by the Beijing Population and Social Development Research Center and the Social Science Academic Press. The report found that Beijing's population hit an inflection point in 2017, with the number of residents with registered permanent residence (or Hukou), and migrants from other areas, both declining for the first time since 1949. The report entitled "Blue Book of Population in Beijing: Research Report on Population Development in Beijing" is intended to measure the city's population trends and then suggest proposals based on these findings. Chaoyang District ranks as the city's most populous area with a population of 3.7 million people, followed by Haidian at 3.5 million. The two districts also have an estimated migrant population of 3 million , making up some 40 percent of the city's total floating population. Analysis showed that population density in downtown areas has also decreased. In 2013, the population density of Dongcheng District stood at 21,715 people per square kilometer. In 2017, it has dropped to 20,330; a 6.4 percent decline. Beijing's population is continuing to age. In 2010, the capital's elderly population stood at 1.71 million, 8.7 percent of the total population. In 2017, the number of people older than 65 years old had increased to 2.38 million, now accounting for 10.5 percent of the city's population. Meanwhile, the proportion of the working age population, residents between the ages of 15 to 64 years old, decreased from 82.7 percent in 2010 to 78.6 percent in 2017. The blue book report called on the government and market forces to coordinate efforts and establish better systems of care for Beijing's elderly population. While stressing an overall improvement of transportation and employment, the report also highlighted several problems in the capital city's sub-center Tongzhou District. For instance, the number of residents living in the southeastern district had increased from 1.36 million in 2014 to 1.5 million by 2017. However, the report found that only 403,000 jobs were available in the district in 2014, meaning more people have been commuting to downtown areas for work, contributing to serious congestion problems. The roads between Tongzhou and central Beijing are now so congested that commuting takes 45 minutes. This compares with Chengdu (31 minutes), Nanjing (37 minutes), and Wuhan (25.9 minutes). The blue book report stressed the importance of balancing the development of housing and employment to improve the traffic situation. It suggested the local authorities take effective measures to solve the problems and raise the quality of people's life. 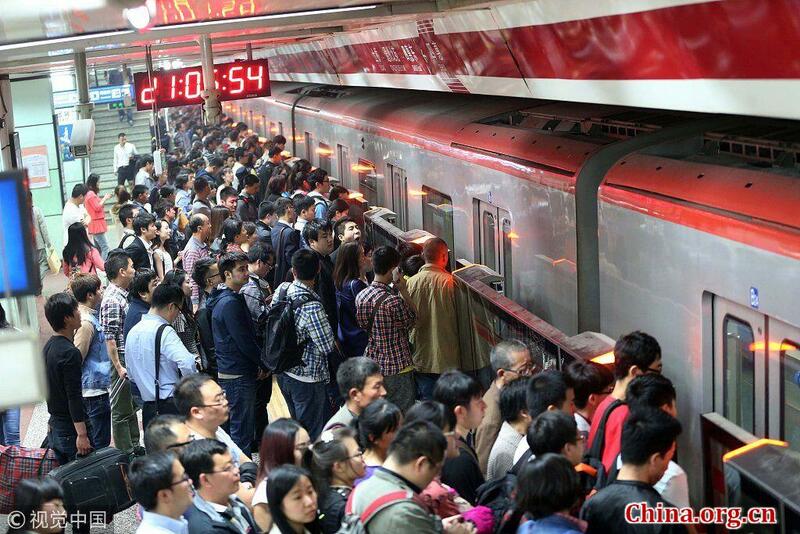 Beijing's population fell by 22,000 last year, according to a new report. Meanwhile, the city's elderly population continues to grow.